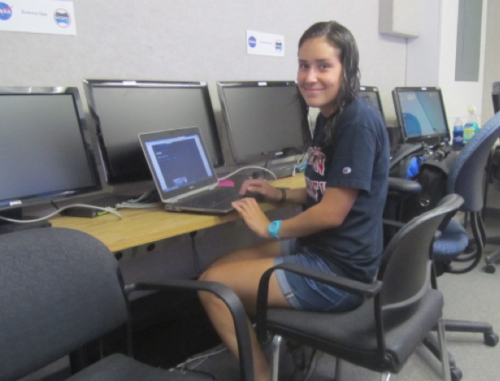 Image at right: NASA intern Kaila Cappello poses from the NEEMO Science Facility. I arrived in Key Largo on Sunday June 10th for the start of the NEEMO 16 mission taking place at the NOAA Aquarius lab located in Conch Reef. After settling in, I got to meet many of the people part of the NASA group and other members of the operations and science teams before we began the first all-hands meeting. After everyone introduced themselves, a quick briefing was given of what is to come during the mission. Not knowing much of what to expect, I begin to realize the amount of work and knowledge that is behind this mission and the amount of intelligence and experience that is packed into one trailer. To say that I was extremely intimidated is a bit of an understatement. An explanation is given to the group about how so many people would give an arm and a leg to be here for this mission, and my excitement grows as I realize how very fortunate I am to be here. After the meeting, I get a tour of the trailer in which the science team is located and some of the other facilities and features of the mission before adjourning for the day. Day 2 started with the aquanaut splash down, the departure of those who are descending to live in Aquarius for the next two weeks to perform operations that will contribute to the understanding and training of the eventual landing on a Near Earth Asteroid. After the boat carrying the aquanauts departs, everyone meets for an all-hands meeting in the MMCC where introductions again are given for the new arrivals. Afterwards, the entire science team meets in our trailer to set up and begin planning for all the dives that will take place over the coming week. Instruction and information is given to the DeepWorker pilots to get an understanding of what the science team wants to get out of the missions. After lunch the team assembles again and we go over the Castaway and EXO2 Sonde software so that we know how to operate them for use in the dives. The Castaway is a handheld instrument that is deployed attached to the DeepWorkers and provides profiles of the conductivity, temperature, salinity, depth, and sound speed over an extended period of time, and the data from the mission can be viewed and collected afterwards. The EXO2 Sonde is a larger instrument in the shape of a cylinder a few feet long that measures even more parameters every second, including dissolved oxygen, pH, ORP, blue-green algae and chlorophyll, turbidity, and fDOM. It uses Bluetooth wireless communication and the data can be retrieved and downloaded after the mission. The Sonde is also attached to the DeepWorkers during each mission. 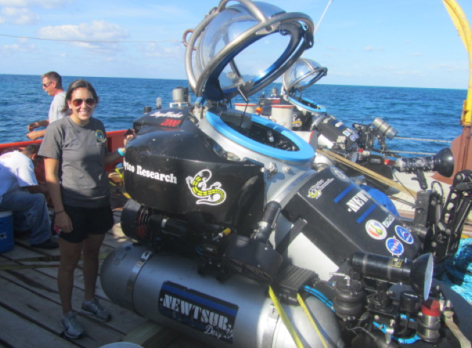 Both instruments were borrowed from YSI Incorporated for NEEMO 16. After we go over the technologies we’ll be in charge of during the DeepWorker missions, we then try to plan out the scuba dives of Mark Patterson and Art Trembanis where they will collect sediment and microbe samples and study closer some areas of spur and grooves as well as the great barrel sponges. A dive is scheduled for the following day to test the sampling device for the microbial samples, the camera equipment, and the flow visualization method of the barrel sponges. The equipment that is needed for the dive then gathered and organized and tasks are assigned to be done before the dive as day 2 comes to an end. On Tuesday, we arrived at the dock bright and early for our originally planned deployment for the Lana Rose at 6:30. Due to some setbacks, our departure was delayed by about an hour. We were given a quick safety briefing once we got onto the boat before leaving for the Lana Rose. Once we arrived to the ship, we transferred all of our belongings and equipment and climbed aboard the 100-foot long salvage vessel. We then began to setting up and testing our equipment to make sure we would be able to easily deploy them for the DeepWorker missions later in the day. We then waited around for awhile as the crew made some preparations for the arrival of the DeepWorker pilots and rest of the science team. When the others arrived, we set up the Castaways and Sonde and got them ready for deployment. When our job was done, we got back onto the R/V Latency to transfer us back to the dock. We then took a break until the estimated deployment time of the DeepWorkers of about 3 pm. When we met back up, we attempted to begin sorting out communications issues between us and the science team on the Lana Rose to get everything up and running properly, and we set up a large television screen with the live feed of a camera mounted on one of the DeepWorkers. We then went over protocol on taking notes of the mission of what we see via the live feed and what we hear from the pilots’ descriptions of what they are seeing. We unfortunately hear of many complications with deploying the subs due mainly to the rough sea state and the inability to safely get the subs in and out of the water using the crane on board, and as more time passes we decide to alter and shorten the planned missions. The deployment time of the subs is delayed still by more and more time until it is eventually called off for the day as it gets too late. Image at right: Cappello greets the DeepWorker sub on the Lana Rose. After a break for dinner, the entire science team meets up to discuss plans for altering the mission schedule since a full day of missions had been lost. We review what went wrong and how we can schedule the rest of the missions to get as much done as possible. Shifting the schedule to night dives is discussed since it is believed that the sea state will be better, and how these changes would affect the pilots, the teams, and the boat crew is also brought into consideration because a change in sleeping patterns could pose a higher risk for the dives. Eventually a decision is arrived at to run a mission starting in the early evening and ending late at night, but to let everyone sleep in the morning before the mission. The next day started late with a science team meeting at 2 pm. We reviewed the plans for the dive to occur later in the day and come up with a tentative schedule for the day, keeping in mind the delays that will inevitably occur and factoring in time to process data and sleep so that everyone gets enough rest. The dive is set for 8 pm and a test dive is also scheduled to occur around 4 to make sure the DeepWorkers can be deployed safely. 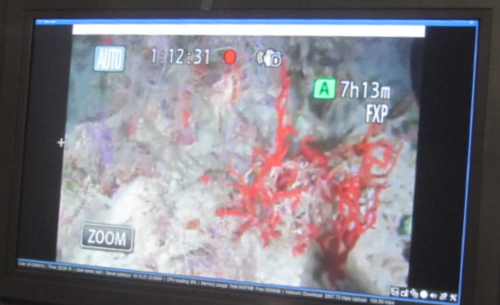 Image at right: A monitor displays images of sponges on the reef. We left for the Lana Rose with the rest of the science team around 6:30, bringing with us the Castaway and EXO2 Sonde equipment. Once we arrived, we quickly set up our equipment and got them ready for deployment and then returned to the dock again soon after. Back in the science trailer, we waited for the subs to be deployed and watched the live feed of the camera mounted on DeepWorker 6 manned by Dr. Stan Love. We took notes as we saw objects and areas of interest on the screen, and we also rated the data quality and the observation quality every 20 minutes. After a few hours, the communications and live feed was delayed by 50 seconds to simulate the delay if the sub was actually as far away as on a Near Earth Asteroid. The mission lasted about three and a half hours before the DeepWorker resurfaced. We then waited around until the team returned from the Lana Rose so that we could turn off the Castaways and Sonde and download the data before finally calling it a night. I am lucky enough to be using this mission for my research internship for the summer on the great barrel sponges in the reef. Throughout the week, I will be helping out with some closer study and tests done on the sponges to use for my research on the distribution of the sponges throughout the reef and the types of environments they prefer to live in. I am extremely excited for the rest of the week and to be on the boat actually viewing some of the dives take place. As an engineer, I am fascinated by the DeepWorkers and the other slew of technologies at work during the running of these tests, and I am incredibly thankful to be given the opportunity to witness some of this amazing mission.